Hair Dye Remover Poisoning is the accidental or intentional intake (swallowing) of any product containing the compound. The substance may also come in contact with the skin or eye and cause irritation and associated symptoms. What is Hair Dye Remover Poisoning? What are the Causes of Hair Dye Remover Poisoning? The chemicals in hair color removers may include a variety of chemicals including sodium and potassium persulfate, denatured alcohol, hexylene and dipropylene glycol, ammonium chloride and ammonium hydroxide, sodium lauryl sulfate, phosphoric acid, hydrogen peroxide, sodium stannate, tetrasodium pyrophosphate, etc. What are the Signs and Symptoms of Hair Dye Remover Poisoning? The signs and symptoms of Hair Dye Remover Poisoning can vary from one individual to another. It may be mild in some and severe in others. Several systems of the body, such as the respiratory system, digestive system, vascular system, skin and ENT, may be affected. How is First Aid administered for Hair Dye Remover Poisoning? Who should administer First Aid for Hair Dye Remover Poisoning? 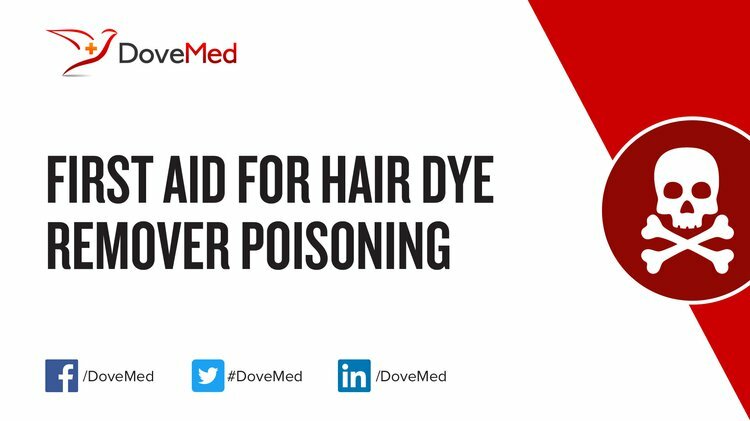 First aid for Hair Dye Remover Poisoning is administered by healthcare professionals. What is the Prognosis of Hair Dye Remover Poisoning? How can Hair Dye Remover Poisoning be Prevented? McKay, G., Porter, J. F., & Prasad, G. R. (1999). The removal of dye colours from aqueous solutions by adsorption on low-cost materials. Water, Air, & Soil Pollution, 114(3), 423-438. Tankovich, N. I. (1999). U.S. Patent No. 5,871,480. Washington, DC: U.S. Patent and Trademark Office. Cairns, T., Hill, V., Schaffer, M., & Thistle, W. (2004). Removing and identifying drug contamination in the analysis of human hair. Forensic Science International, 145(2), 97-108. Chung, K. T., Murdock, C. A., Stevens, S. E., Li, Y. S., Wei, C. I., Huang, T. S., & Chou, M. W. (1995). Mutagenicity and toxicity studies of p-phenylenediamine and its derivatives. Toxicology letters, 81(1), 23-32. Hoffman, R. M. (1998). Topical liposome targeting of dyes, melanins, genes, and proteins selectively to hair follicles. Journal of drug targeting, 5(2), 67-74. Tobin, D. J. (Ed.). (2005). Hair in toxicology: an important bio-monitor (Vol. 1). Royal Society of Chemistry. Cardoso, N. F., Pinto, R. B., Lima, E. C., Calvete, T., Amavisca, C. V., Royer, B., ... & Pinto, I. S. (2011). Removal of remazol black B textile dye from aqueous solution by adsorption. Desalination, 269(1), 92-103. Watt, B. E., Proudfoot, A. T., & Vale, J. A. (2004). Hydrogen peroxide poisoning. Toxicological reviews, 23(1), 51-57.